Sometimes my patchwork heart aches so. So many pieces missing. So many scars and repairs. How do we go on? Sometimes, like last Friday, joy evaporates and is replaced with a rush of pain and then the ooze of black bilious anger that seeps out of every pore when I feel dread fear combined with a feeling of defeat and hopelessness. ‘How can the universe allow this to happen?’ I storm, faced with the intense suffering of someone I love. What helps? To recognize that all I can offer is what I’ve always only ever been able to offer – love, gentle presence and small supportive things that might help. And for my soul to heal? Taking time in nature. This week, I am blessed to have a work trip to the Catskills. 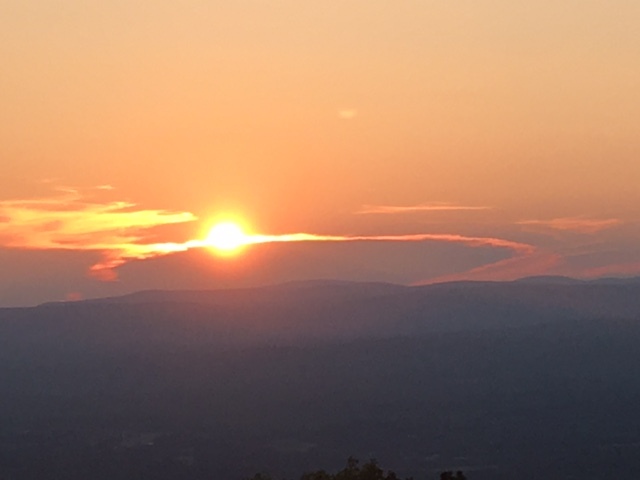 Tonight I watched, from my terrace at the Mohonk Mountain House, as the sun turned to marmalade over what looks like 30 miles of mountains and forest. It felt like a soul meeting with time immemorial; reminding me that we are more than these bodies, more than these lives. We are love without end. Lucie, so glad you are open to what the universe offers you to give you solace. Sending you some soothing vibes and your loved one healing and calming ones.